The Caledonian Society: We are a non-profit 501c(3) educational and cultural organization, which was founded in 1965. We are dedicated to providing programs for our members and the public that highlight the cultural uniqueness of Scots and Scotland. We also promote fellowship among the Scots and those of Scottish descent who live and visit Hawaii. Membership is open to anyone interested in Scotland, its contributions, its history, its culture, and its importance to Hawaii. Through our various activities, we seek to provide greater awareness and understanding of Scottish heritage. The activity year for the Society begins July 1, following the Annual General Meeting, normally held in June. Some of our activities include cultural events with topics like genealogy, dance, music, history, famous Scots; films highlighting Scotland; soup supper and ceilidh; Clan Night; and similar topics of interest. The highlight of our activity year is an annual dinner honoring the memory of Scotland's national poet, Robert Burns. Burns was born on January 25, 1759 and his birthday is celebrated throughout the world. 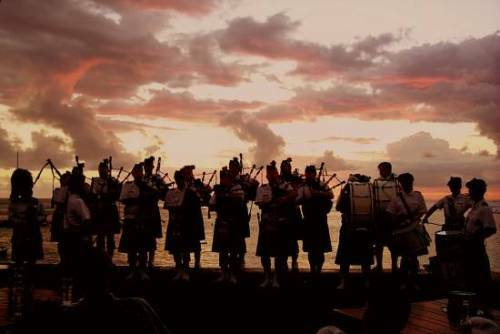 In Hawaii, this gala affair, with kilts and sashes in full view, features haggis, whisky, bagpipes, songs and dances to keep the night merry. The traditional "Address to the Haggis" and "Tribute to the Memory of Robert Burns" are always well received. Since 1989, The Caledonian Society has paid special tribute to Princess Ka'iulani, our Scottish-Hawaiian princess, who died at a young age and is buried at the Royal Mausoleum in Honolulu. She was much revered by her people and The Caledonian Society honors her memory, as does the Ahahui Ka'iulani, a Hawaiian organization dedicated to her memory. A special ceremony is held at the Royal Mausoleum in late March or early April each year. The Caledonian Society of Hawaii is a founding sponsor of the Hawaiian-Scottish Association, which was established in 1982 to produce the annual Highland Festival. This is an important occasion for the Scottish community to make itself highly visible to locals and tourists alike. The two-day event is usually held the first weekend if April and includes highland games sports activities, bagpipe bands, Highland and Scottish Country dancing, cultural exhibits, clan representatives, Scottish food and products, and other types of entertainment and exhibits to highlight Scottish culture. Additionally, the Caledonian Society maintains a small library of books about Scottish culture, history and clans at Alexander Manor. This library is open to all Society members, during normal business hours at the Manor, which is located at 1559 Thurston Ave. 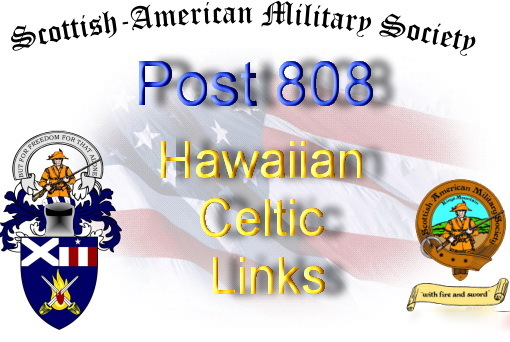 The Celtic Pipes and Drums of Hawaii is a 501(c)3 organization. WE PROUDLY REPRESENT: the Honolulu Police Department and the Honolulu Fire Department. Band practice is held every Wednesday evening, with the exception of holidays and nights when performances are scheduled during practice time. Chanter and Drum pad practice starts at 6:30 p.m. Interested in trying out Irish Dance? Contact us to sign up for a free lesson! We'll match you with the best class for you or your dancer, based on age, skill level, and availabilty. We have classes for all ages, boys and girls from 5 years to Adult. According to tradition, Scottish Highland Games had their beginnings when originated by the old kings and chiefs of Scotland as a reasonably agreeable method of choosing the best men available for their retinue and as men-at-arms. Crude forms of the athletic events you will see were developed to test the contestants for strength, stamina, accuracy and agility. Of course, they used the elements and materials of their day-to-day life, therefore the caber toss, stone put, hammer throw, weight lift and weight toss were born. The Saint Andrew Society of Hawaii was formed on November 30, 1989. The founders established the society as a non-profit, charitable organization whose primary purpose is to establish and administer a fund to provide educational scholarships for students of the Scottish traditional arts including music, dance, history, and culture. We also provide financial aid to other Scottish organizations by offering grants and helping to fund cultural and educational activities. Our goal is to eventually establish a Hawaiian Scottish Cultural Center. The Society was organized and registered in Honolulu on March 17th, 1955. The objects and purposes of the corporation were to be charitable and benevolent in alignment with the founding organization of 1771 in Philadelphia. Since then, the members of the Society have conducted well-attended monthly meetings, and gradually defined a "Social/Educational" context which is implemented and expanded as the years go by. 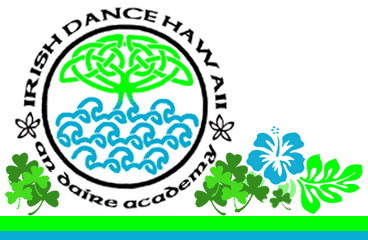 The Hawaii Branch of RSCDS, an international organization headquartered in Edinburgh, Scotland, was founded in 1973 to provide Scottish Country Dance classes in a non-profit organization that teaches dance classes through the Moiliili Community Center between September-June on Wednesday evenings from 7-9 pm. Scottish Country Dancing is the social dancing of Scotland and includes Jigs, Reels, and a unique Scottish dance called a Strathspey. Anyone interested in Scottish Country Dancing can stop by on a Wednesday evening or find out more by clicking the above link. 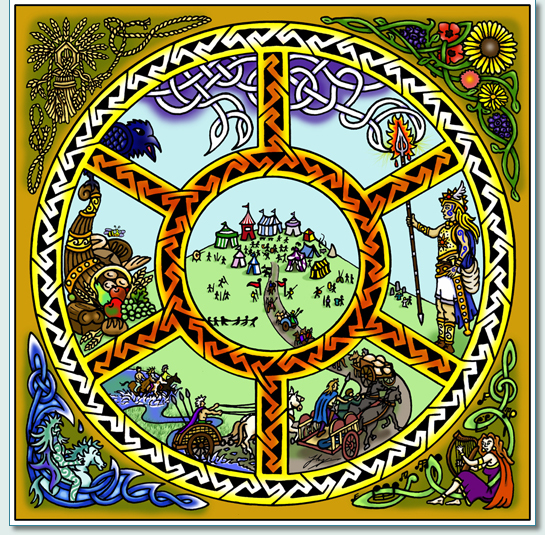 A celebration of the triple aspect of the mind body and spirit of the celts through history, artwork and music. We play Irish music in the old traditional style. 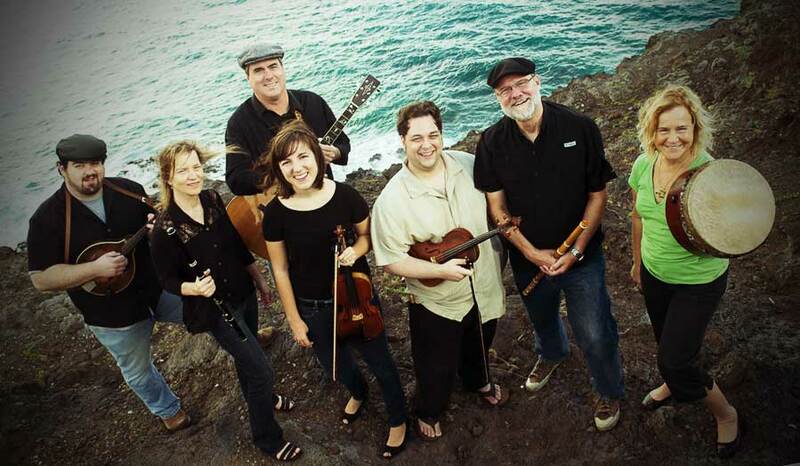 Come hear us and tap your feet to a lively blend of jigs, reels, hornpipes and songs with an occasional slow aire. We really enjoy playing this music and invite you to come share the "ceoil agus craic" (music and fun). 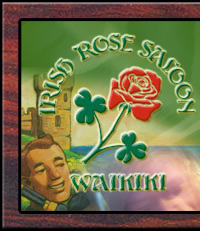 Partners and fellow Irishmen William Comerford and Fred Remington own and operate the Irish Rose and Kelley O'Neil's in Waikiki and O'Toole's in downtown Honolulu. The partners have run the company since 1998 when they bought it from Elaine and Jim Fessenden (hence the E & J in the name). The couple had been running the Irish Rose Saloon since opening it in 1985 and they were ready to retire. At the time, Comerford and Remington were bartenders at the Irish Rose and both made offers to buy the company.